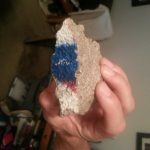 And shortly after the wall came down, I went to Berlin and grabbed my own piece of it. Register to receive these posts once a week by email and get the blissful yoga routine in an eBook “Ahhhhh…Haaaaaa Moments with Ms. Cheevious” by Lisa Jey Davis for FREE as a result. Registration is on the right side bar of every blog post, or on our Facebook page. See you next time. Blog content copyright 2014, LISA JEY DAVIS a.k.a. Ms.Cheevious.